The increasing secularization of political thought between the mid-seventeenth and mid-nineteenth centuries has often been noted, but rarely described in detail. 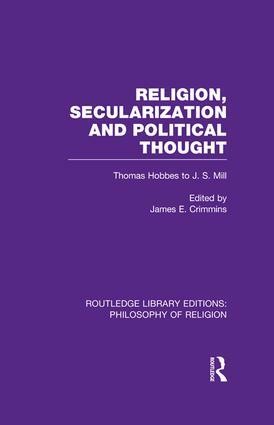 The contributors to this volume consider the significance of the relationship between religious beliefs, dogma and secular ideas in British political philosophy from Thomas Hobbes to J.S. Mill. During this period, Britain experienced the advance of natural science, the spread of education and other social improvements, and reforms in the political realm. These changes forced religion to account for itself and to justify its existence, both as a social institution and as a collection of fundamental articles of belief about the world and its operations. This book, originally published in 1990, conveys the crucial importance of the association between religion, secularization and political thought. John Locke: Socinian or natural law theorist?